It only happens once a year, and any outdoor enthusiast in the Pacific Northwest will tell you it’s a can’t miss event. 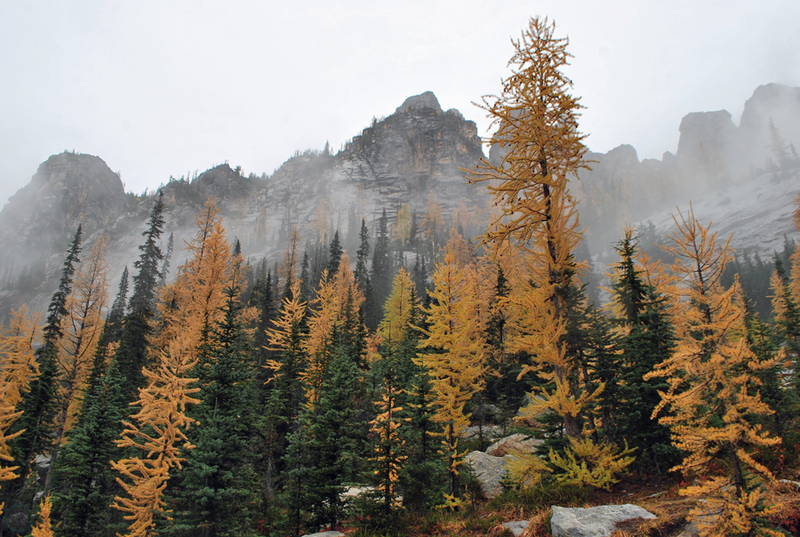 I’m talking about golden larches in the Cascade Mountains. Every October, hikers head to the hills to admire these spectacular trees. 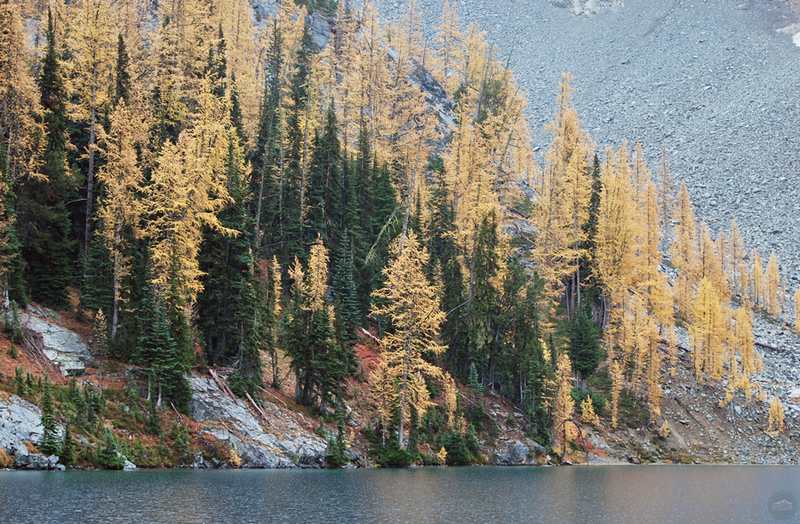 One of the most popular places to see golden larches in the fall is Blue Lake in the North Cascades. First off: what is a larch? Larches are unique because they are a deciduous conifer tree. Unlike other cone-bearing trees (like firs, etc. 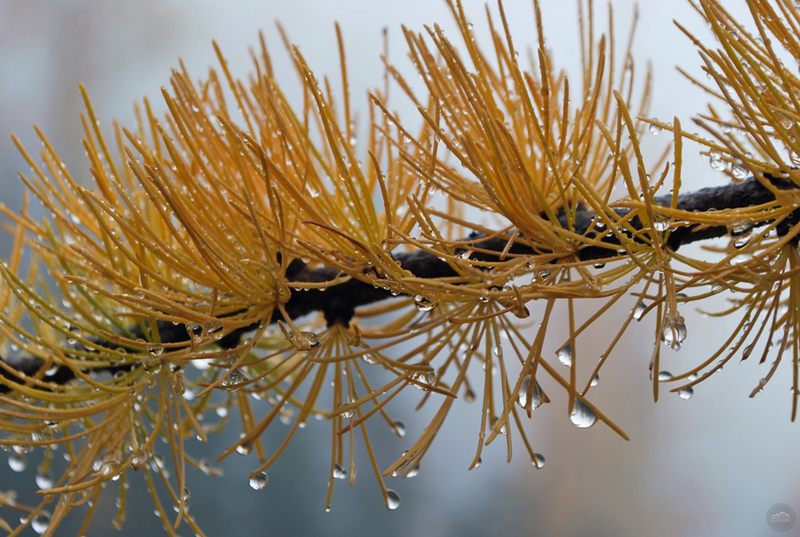 ), larches lose their needles (which are actually leaves) every fall. It’s never known exactly when the larches will turn golden every year, but it typically happens in early to mid-October. 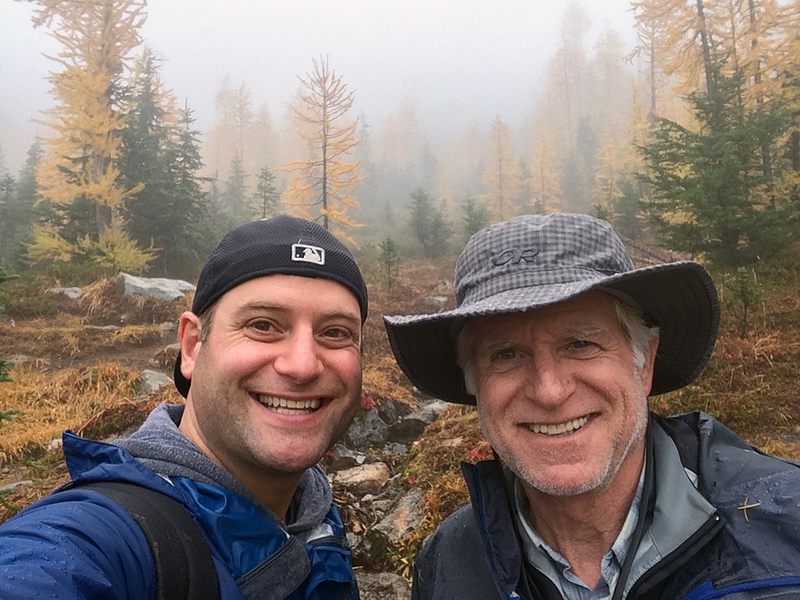 My dad and I saw the golden larches at their peak when we went hiking to Blue Lake on October 7th. 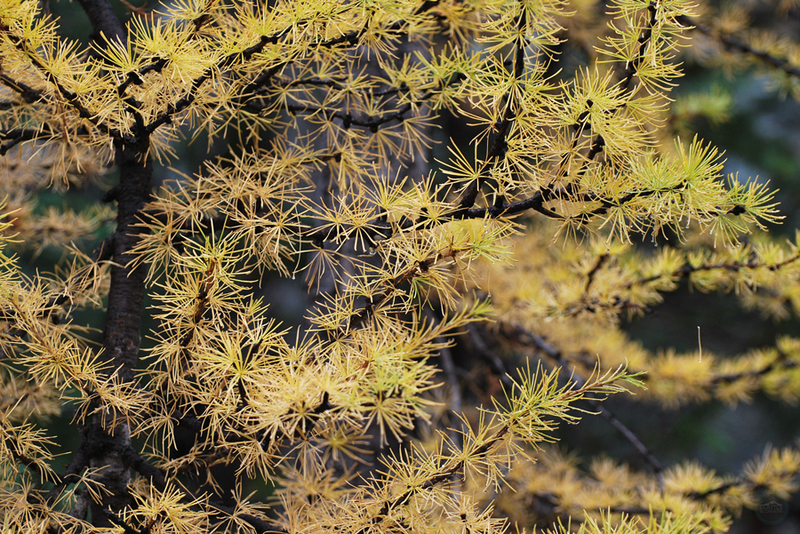 TIP: Again, golden larches reach their peak at different times every year. I would suggest checking the latest Washington Trails Association Blue Lake trip reports (at the bottom of this page), or even searching for Blue Lake or golden larches on Instagram to get a feel for when the leaves are starting to turn. Peak doesn’t last long (and it only happens once a year), so it’s a very small window to enjoy golden larches. 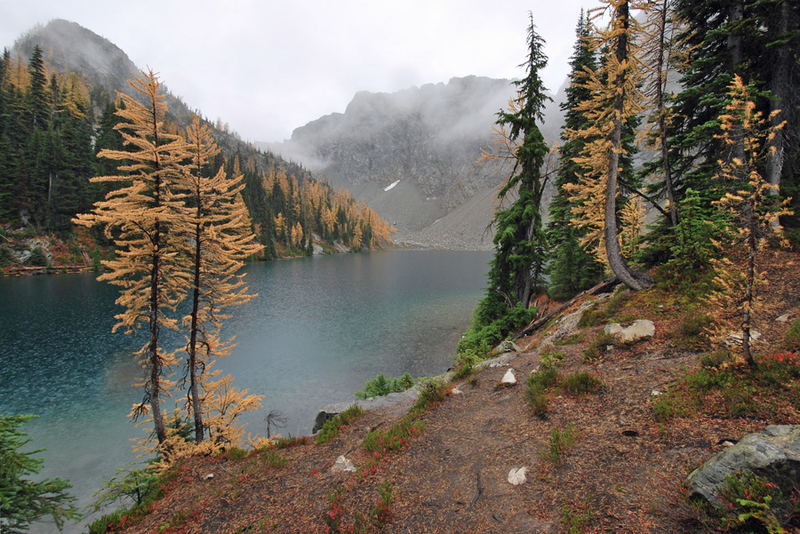 I’ll be completely honest, checking out golden larches at Blue Lake is a commitment from Seattle. The drive from downtown to the Blue Lake trailhead takes about three hours. You take I-5 North to Arlington, cut across Highway 530 to Rockport, and then hit Highway 20 to the trailhead (about 42 miles outside of Newhalem). The parking lot for the Blue Lake trailhead is clearly marked with signs, and it’s located right off the highway. 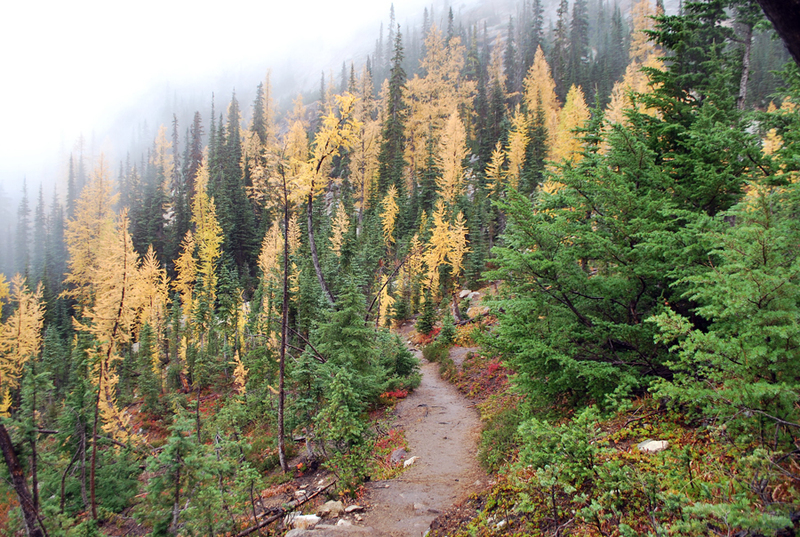 Look to the hills from the parking lot for your first glimpse at golden larches. TIP: Highway 20, which is also known as the North Cascades Highway, is very scenic on its own. There are several overlooks and viewpoints along the way to Blue Lake. To make the most of your trip, you might want to allow extra drive time to stop and enjoy the beautiful scenery. Once you get to the trailhead, the hike to Blue Lake is pretty easy. It’s only 4.4 miles round-trip (with an 1,100-foot elevation gain) to reach the lake. You start the trek by walking over a few boardwalks and meandering through the forest. I’d say a little more than a mile into the hike, you start to become surrounded by golden larches. Even on a misty, rainy day (which we had on our adventure to Blue Lake), the golden larches are stunning at their peak. The surrounding granite peaks help add to the overall beauty of the hike. You’ll see golden larches the rest of the way to Blue Lake, and they even surround the lake at the top. The lake itself is small, but it’s located right at the base of towering peaks. It was a beautiful sight through the mist and fog, but I can only imagine how incredible Blue Lake is on a clear day. Located at an elevation of 6,254-feet, there is snow near the lake — even in October. In other words, you might want to bring warm clothes. There are two trails you can follow once you reach Blue Lake. There’s the lower loop, which takes you along the lake’s edge, and there’s also the main loop, which takes you higher above the lake. Both offer nice views of the lake and golden larches. On a nice summer or early fall day, you can even take a dip in Blue Lake. No matter what, you should at least sit down on the rocks and enjoy lunch or a snack at the lake. It’s an awesome setting. 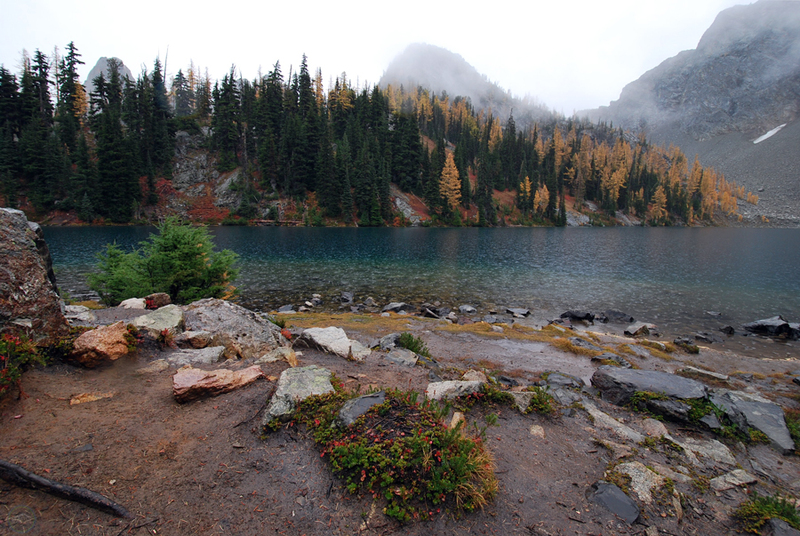 There aren’t many places around the state to see golden larches, especially with the ease of the Blue Lake hike. It’s a long drive to get there, but if you get to see the golden larches at their peak, it’s worth every second. 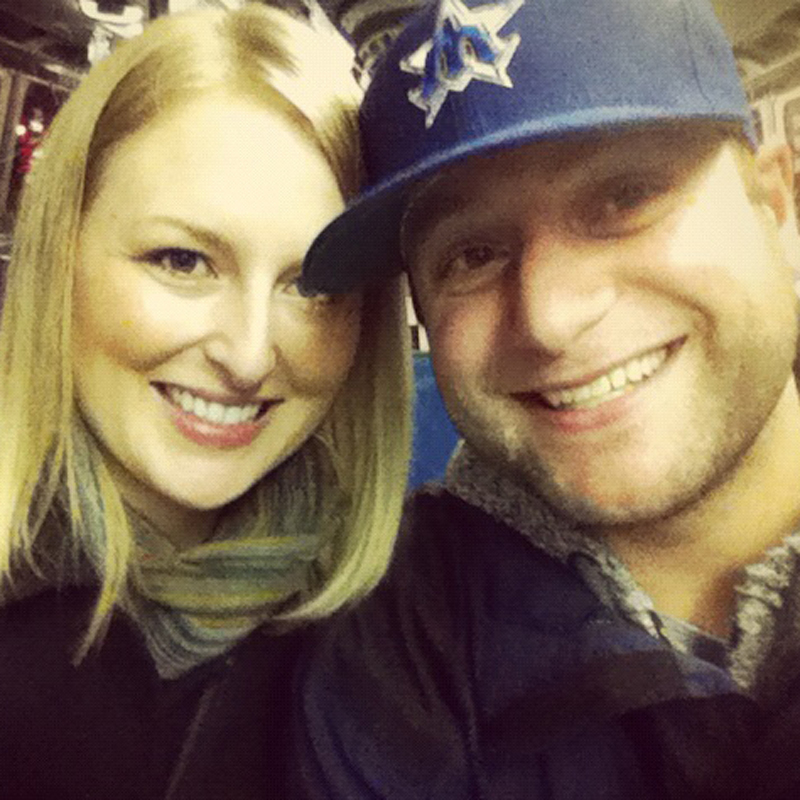 And that’s coming from a guy who made the trek on a rainy day. Don’t miss your chance to see golden larches at Blue Lake! Have you ever seen golden larches at Blue Lake? How was your experience? Where else have you gone to see golden larches? We’d love to hear from you! Please leave a comment below or connect with us on Twitter, Facebook, and Google+. Don’t forget to also check out Seattle Bloggers for more great places to hike around the Emerald City!